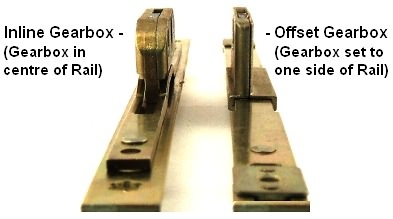 An espagnolette upvc window lock is the gearing part inside a window that a spindle drive upvc window handle operates. The picture below shows one of many different types. The long metal plate is the rail and the part in the centre is the gearbox. Know which lock you need? 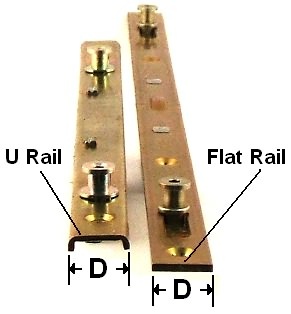 Visit our UPVC Window Lock Section. Espagnolette window locks have different backset measurements. It is important that the backset of the replacement is the same as the backset of the original otherwise modification of the window frame may be required. There are three holes in the side of every gearbox, the centre one being the spindle hole and the other two are screw holes for the handle. The distance between these three holes is universally the same at 43mm. All of our espagnolette window locks have mushroom cams but can be used without problem in place of ones with roller cams. There are many different makes of espagnolette window locks but they are interchangeable as long as they are of the same backset, rail length, rail width, cam height and still inline or offset. If a different make is used but they are otherwise very similar then it is likely that the keeps will need to be re-positioned due to the cams being in a different position on the rail. On occasions the hole for the gearbox in the window frame may need to be enlarged when using a different brand but it is rare. 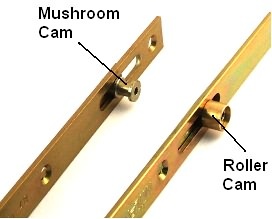 Note: Most types of espagnolette window locks have adjustable mushroom cams. These can be adjusted using an allen key or sometimes a flat headed screwdriver to increase compression on a slack window (symptom: handle goes into closed position too easily) or decrease window compression on an over tight window (symptom: handle has to be forced into closed position).